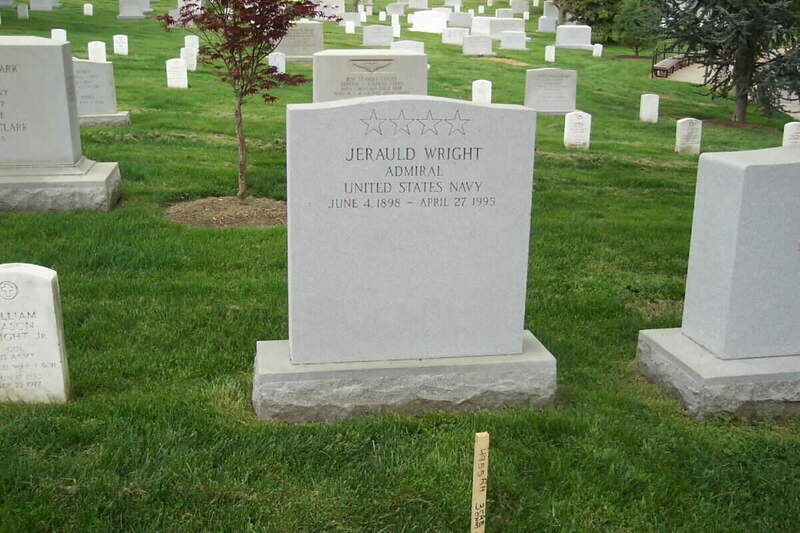 "Jerauld Wright, 96, a retired Navy Admiral who was a heavily decorated combat veteran of both World Wars and who had served on the Central Intelligence Agency's Board of Estimates and as Ambassador to Taiwan, died of pneumonia on April 27, 1995 at his home in Washington, D.C.
"During World War I, he was a junior Lieutenant aboard a gunboat on anti-submarine duty in the Mediterranean. During World War II, he was Captain of a battleship in the Atlantic, held senior staff positions in Europe and participated in clandestine missions in the Mediterranean. He then participated in many of the great battles of the Pacific, where he rose to command a cruiser division with fast carriers. Along the way, he became an authority in the joint operations of naval, ground and air forces in amphibious operations. "Much of his postwar career dealt with the NATO alliance. From 1952 to 1954, he was commander of US Naval Forces in the Eastern Atlantic and Mediterranean. From 1954 to 1960, he was U.S. Atlantic Fleet Commander and NATO Supreme Commander in the Atlantic. After he retired from active duty as a four-star admiral in 1960, he immediately recalled to serve on the CIA's Board of Estimates. He held that post until serving as Ambassador to Taiwan from 1963 to 1965. When he retired from active duty in 1960, the Washington Post published an editorial lauding the Admiral for serving his country well while holding "one of the free world's two most important unified commands." The editorial also drew attention to his conviction, purpose and diplomatic and military skills and to his self-effacing qualities. "Admiral Wright was born in Amherst, Massachusetts. In 1917 he became the youngest person to graduate from the United States Naval Academy. Between the wars, he saw service aboard destroyers, cruisers and battleships and served in the Atlantic, Pacific and Asiatic fleets. He also was Naval Aide to President Calvin Coolidge from 1924 to 1926 and to President Herbert Hoover from 1929 to 1931. "After the outbreak of World War II, he commanded the battleship Mississippi on North Atlantic patrols, then was called to Washington, D.C. where he worked on amphibious and joint operations plans before going to London to work on plans for the North African landings. In late 1942, he accompanied Army General Mark Clark aboard a submarine to Algeria, where they had secret meetings with French officials. They unsuccessfully attempted to get the French to welcome the Anglo-American forces that would hit the beaches in Operation Torch. He later commanded the operation and accompanied the submarine that secretly evacuated French Army General Henri Giraud and his staff from Southern France. After participating in the North African landings, he helped plan and execute the amphibious landings in Tunisia and for the landings in Sicily and Salerno. In December 1943, he went to the Pacific, where he first commanded the light cruiser Sante Fe with the fast carriers of the 3rd and 5th Fleets. He later commanded an amphibious group and a carrier division. He participated in the fighting for Kwajalein, Saipan and Okinawa and fought in both battles of the Philippines Sea and in the Battle of Leyte Gulf. "After he retired as an Ambassador, he was a consultant to the State Department for a time. Over the years, he had contributed articles to the Navy Institute Proceedings and other publications. He had served as the President of the Metropolitan and Alibi Clubs of Washington. He was a member of the Chevy Chase Club. His Naval Medals included two Distinguished Service Medals, the Silver Star, two awards of the Legion of Merit and the Bronze Star." He is buried in Section 2 of Arlington National Cemetery. Phyllis Thompson Wright, 96, a society editor with the old Washington Star and the widow of a retired Navy admiral, died October 20, 2002 at National Naval Medical Center in Bethesda, Maryland. She had cancer. Mrs. Wright, a Washington resident, worked at the Star from 1936 to 1938. She left the newspaper when she married Jerauld Wright, who became Commander of the Atlantic Fleet, NATO Supreme Allied Commander in the Atlantic and ambassador to Taiwan. She accompanied him on many of his assignments. During World War II, she was vice chairwoman for public relations with the American Red Cross chapter in Washington. She also did volunteer work for the Navy Relief Society. She was a New York native and made her debut in 1924 along with Janet Lee, future mother of Jacqueline Kennedy Onassis. In New York, she did clerical work for the Women's Organization for National Prohibition Reform, which fought for the repeal of the 18th Amendment barring the manufacture, sale or transportation of alcohol. She came to the Washington area in the early 1930s and took jobs at the Federal Alcohol Control Administration and the Federal Housing Administration. She was a former president of the Sulgrave Club and a member of the Metropolitan and Chevy Chase clubs. 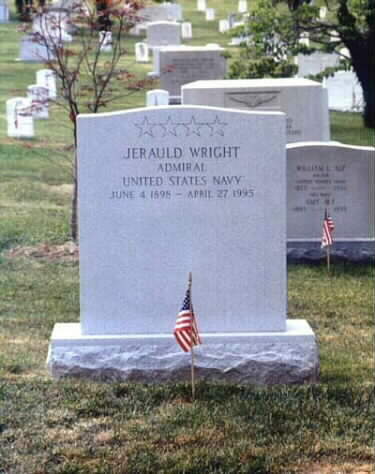 Adm. Wright died in 1995. Survivors include two children, Marion Wright of Denver and William Wright of Arlington.